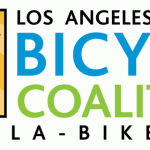 Logo and Identity for the Los Angeles County Bicycle Coalition. 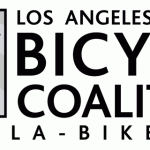 The original logo for the Los Angeles County Bicycle Coalition was at some point re-worked with the help of a designer a few years prior to my involvement with the organisation. Unfortunately, the death nell of “Design by Committee” took effect and the resulting logo was an odd, mis-matched mix of qualities which confused scale, connotation, and aesthetics. 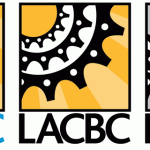 My goals in the re-design of the logo for LACBC were multi-fold: 1. Give the logo some strength of character, 2. Make the logo identifiable with or without the logotype, 3. Develop the logotype to represent the direction of the organisation, 4. Establish Process and Spot colors for future use of LACBC identity, 5. Develop variations of logo and logotype to allow for placement of logo on a variety of formats and backgrounds. Ultimately the design of the logo was developed as a continuity from the previous logo that was hindered by the “Design by Committee” method. The gear elements were increased in scale to give the logo strength and presence. A font was chosen, then developed by hand to better accentuate an intention of a modern, progressive and fully representative organisation. Colors were refined for presence as individual states and in juxtaposition with each other.